How’s this for value? In Swiftspeak, Sport denotes more wallet-friendly – and, just as critically, lighter – versions of its ever-popular Challenger SE series. However, the two ranges do not mirror each other and, as a big “for instance” – the 514 reviewed here is an exclusive layout to the 2015 Sport line-up. Indeed, 2015 sees Swift cropping the Sport to eight models – there were ten last time around, but only the fittest survive here. This is not a layout you’ll see so much these days generally, either, although it’s very much the floorplan that got the UK market interested in the concept of permanent beds. 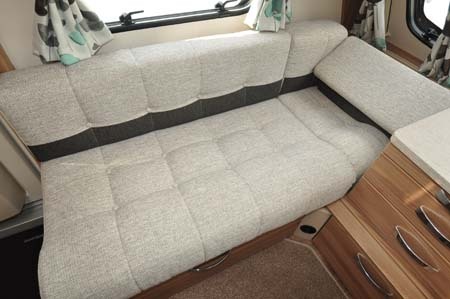 The rear double here – referred to as a French bed because of its cutaway lower section, which allows easier access to the washroom adjacent – took some time to be accepted in the UK, despite huge success in other caravanning countries. Perhaps of more import is the acronym SMART, for the latest way Swift makes its bodyshells. The timber-free construction technique, with ten-year warranty, is into its second season now. The distinctive Challenger Sport looks remain, too, and the decals have had but the slightest of changes, although these Scorpion alloy wheels are new (and exclusive to Swift). Also new here is the one-piece door, while there’s a 40W solar panel on the roof for this season. You’ll also notice some further updates as soon as you enter. There’s the new Aralie Sen furniture finish, complemented by a chrome finish to the electrical switchgear and locker door handles. Latest upholstery is called Zimba, although there are a couple of alternatives, too. But it’s also the measurements that matter. That rear double is a generous enough 1.98m x 1.33m (6ft 6in x 4ft 4in), and it benefits from a super-comfy Duvalay Duvalite mattress (another Swift exclusive). At the front, you’ll also get a double of 2.02m x 1.53m (6ft 8in x 5ft), although as singles they’re just 1.53m (5ft) and 1.60 (1.53), nearside and offside respectively. That, of course, means short settees in day mode, although the angled cushions at the far ends are ideal for lying back on, for example for watching TV. Interior lighting is all LED now, too. Heating and hot water are courtesy of Truma’s Combi 4 system. The kitchen gets the latest Aspire 2 full cooker from Thetford, alongside the usual Swift sink with add-on drainer arrangement. There’s also a Dometic fridge here (capacity is up to 110 litres, with removable freezer section), while general storage space also includes a dedicated cutlery drawer and handy worktop extension. And there’s a microwave. Further along, and beyond the wardrobe, putting the handbasin outside the washroom of course frees up more valuable toileting and showering space. A folding door for the latter is an improvement, as is the more powerful, yet water-saving Eco Camel showerhead. The security conscious amongst you will be pleased to know that once again all new Swift caravans, including this one, are fitted with the Tracker Retrieve system, meaning it does qualify for a lower insurance premium. 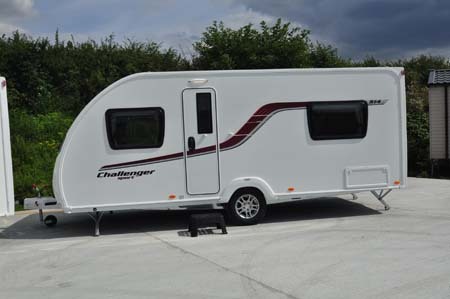 Somewhat surprisingly, although Swift competes almost head-on with the likes of Bailey and Elddis across the whole tourer market, there are no direct rivals to the Challenger Sport 514 from its usual adversaries. Maximum weight here is 1,384kg, putting the 514 in reach of plenty of capable towcars without you having to go down 4×4 routes. 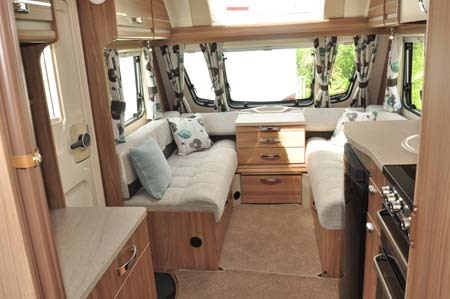 Despite its four-berth status, a layout like this will always find more favour with couples. That’s not to deny its appeal to families with two young (ie short) children. Or, perhaps most likely of all, you might want to invest in such a ‘van so that you can take your young grandchildren away. Or at least promise to! There’s also the Sterling Eccles Sport 514 – same ‘van, same maker, different looks inside and out. However, do look out for a generous choice of special editions versions from leading Swift dealers across the country – they may weigh a bit more, but more often than not they offer even greater value for money. There’s more information on the Challenger Sport range on the Swift Group website and to find out more about our low-cost premiums visit the caravan insurance discounts page. Alternatives: None from other manufacturers! It’s Swift Group stablemate the Sterling Eccles Sport 514 provides an alternative look in the same layout. We have just bought this 514, the Sterling version. My wife was particularly taken by the upholstery while I found the smaller bathroom suited us as we tend to use sites with shower facilities. Having moved from a rear kitchen 2-berth Sterling Coastline we are really enjoying the extra space this van offers and the bed being always ready. The only negative is some of the drawer lock mechanisms are temperamental but as my dealer is some distance away we will just live with this until it’s first service when we hope to have the problem handle/locks replaced. Looking forward to our first major outing in August, ferry to Scotland for a few weeks in Yorkshire, Norfolk and the Home Counties. Thank you to those who gave constructive feedback. I would welcome those who would like to comment on Swift’s products to join the Swift Talk forum which has around 13,000 members. This is an excellent place to provide comments which members of the Swift Technical team can pick up. I like the idea of squeezing all the comfort in just a small space but i think they could have given more room for the bathroom. Women would love to see more functional bathroom. You know how important it is to us. Just saying. 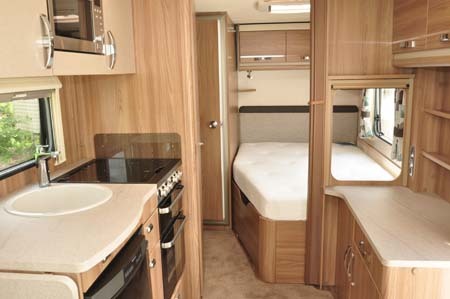 We have the 544 sport not a fixed bed but horseshoe seating area, but with a full washroom toilet etc. Cannot fault it tows lovely has a roomy wash room handy after a days walking. the blown air heating if very quick to heat up a very well insulated caravan. We’ve just returned from a tour of the Lakes, Cairngorms and North yorks moors, not once was the caravan cold. 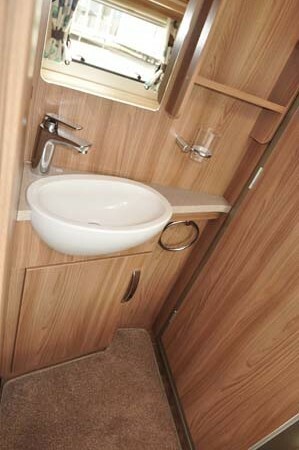 For sites with limited or no facilities this is a very comfortable useable caravan. Not sure about the drop-leaf table over the seating; drips do occure. Almost identical layout to our Lunar Spirit. The grainy woodwork looks cheerful. I do not see a heater, but presumably there is one somewhere. Window lighting seems good, but does the front roof window open? The corner fixed bed can be a challenge for a quick exit, but they are more comfortable. The front seating by the doorway may benefit from a cushioned wedge; I’m thinking elbow-resting-facility. NOT my layout of choice. Of the fixed bed styles, I love the new island bed layout with the retractable bed, and would only choose this over my current L shaped lounge/sleeping area. If I’m going to lose living space, it has to be for a good reason and not to be squished up against the caravan wall. 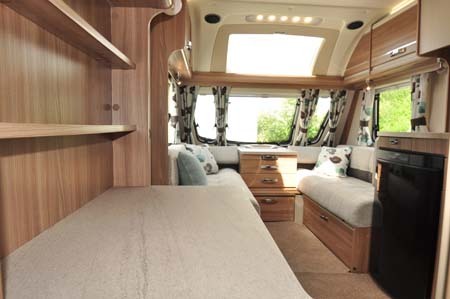 Thanks for sharing your feedback Linda – layout is such an important feature in a caravan so it makes sense to go for one that best suits your needs. 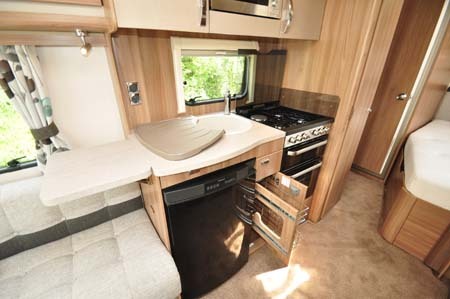 I think this layout is superior to those using a full width rear washroom which really is a waste of space for those who use the full campsite facilities. 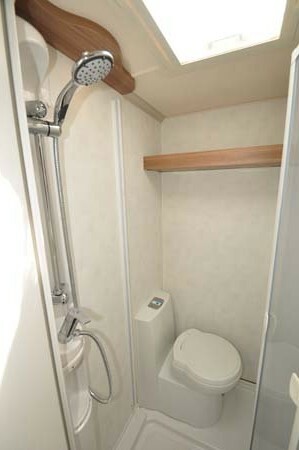 I is a pity that the small shower / toilet cubicle has been abandoned by most manufacturers. Another variation on the Sport 554 however it does not address the issue of a proper mattress and better utilisation of internal space so why not make the bed fold down and use the space for extra seating similar to the 544. due to height restraints the rear seat cushion could be used to fill in at the top end of the mattress under the pillows.